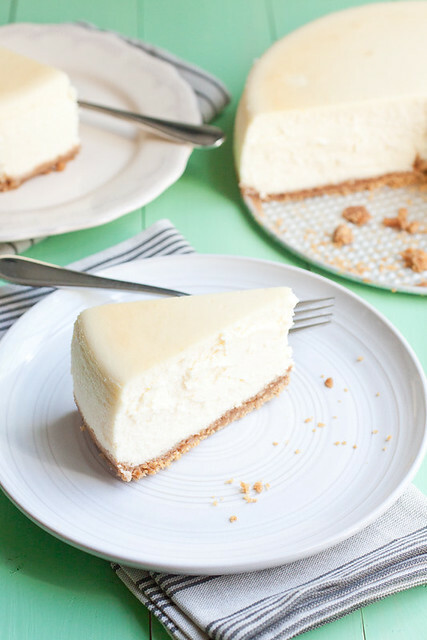 New York Cheesecake: This classic cheesecake rivals any of the cheesecakes from the most well-known NYC restaurants and now you can EASILY make it at home! Note: With new photos and lots of tips, this is an updated post of my original Tall and Creamy Cheesecake post. Do you feel like you’ve really accomplished something in the kitchen when you are always asked to bring the same dish to every holiday dinner? Like all those dishes were really worth it? Or does it annoy the heck out of you because you loving trying new recipes? Because for me, this cheesecake is what I’ve become known for. And I loooove this. This tall and creamy classic New York cheesecake is IT, my friends. It is the best. It’s a cheesecake that I know will turn out perfectly every single time I make it. And honestly, I’ve lost count as to how many times this dessert has hit my belly over the years since I first made it. The short and sweet crust is the perfect crunchy compliment to this insanely creamy dessert. My dad is the person I love to watch eat this cheesecake the most. That first bite, first sigh. And all of the subsequent ones as well! After growing up in the Bronx and bouncing around the city for a good portion of his life, my dad is preeetty familiar with good New York cheesecake. This cheesecake though, ranks in his top 2. I’d love to say that its his #1 but I’m pretty sure the cheesecake we ate at Carmine’s in February just eeked this one out of 1st place. I won’t actually be bringing this cheesecake to the brunch we’re having for dad this weekend (but rather some New York crumb cake and batter and toppings for these yeasted waffles) but I know any dad would go totally nuts for this on Father’s Day, just like mine does. After having made this New York cheesecake more times than I can count in the past 9 years, I have assembled 11 tips for how to make the best cheesecake. Ready?! Don’t fuss too much with the crust. I have always found that a short crust on a cheesecake make it easier to remove from the springform pan than a taller one. The cheesecake releases easier than the crust does from the sides of the pan. So keep it short and simple. This also means there’s no struggling to build up the crumb mixture against the sides of the pan before blind-baking it. Use wide-width heavy-duty aluminum foil to wrap the springform pan. A single layer of this foil works much better to keep out the water from the waterbath than 2 layers of regular foil (see more about the waterbath below). Start with room temperature cream cheese and eggs. This is SUPER important! If your cream cheese is cold, it will leave lumps in your cheesecake batter. So, leave the cream cheese blocks (in their sealed wrappers) on the counter for at least 4 hours before starting your cheesecake. Don’t worry, they won’t spoil. Leave the eggs at room temperature for at least 2 hours. Scrape down the sides AND bottom of the mixing bowl frequently with a rubber spatula. This will ensure the ingredients are evenly distributed as you mix up the batter and no lumps of sugar or cream cheese are left at the bottom of the bowl. Nobody likes a lumpy batter. Be sure to allow the eggs enough time to be beaten into the batter. It will seem like an eternity, but each egg needs to be beaten in – one at a time – for 1 full minute. This helps to aerate the batter and ensure maximum creaminess. Use a waterbath. This is a divisive topic in the cheesecake world but a waterbath really does help to cook the cheesecake slowly and evenly and helps to prevent cracking. Don’t skip the waterbath. The post-bake oven time is essential. 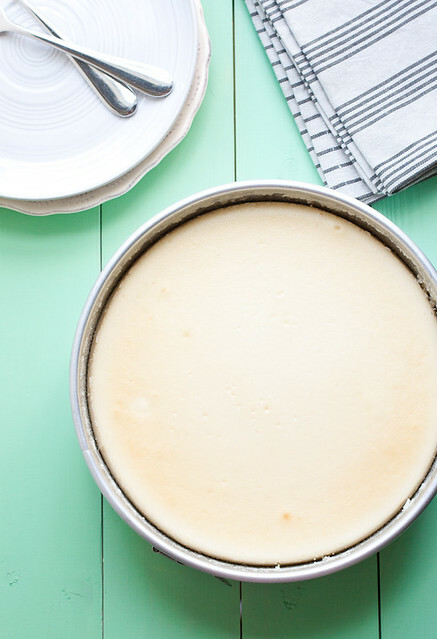 While it might seem crazy to allow the cheesecake to “cool” in the hot turned-off oven with the door propped open with a wooden spoon, this step is essential to allowing the cheesecake to begin a slow cool-down period. This slow cool-down also helps to prevent cracking. The cheesecake should be at room temperature before moving it to the fridge. I recommend this for 2 reasons: 1) A warm cheesecake can alter the temperature of your fridge, and 2) Condensation will build up on the foil you cover the cheesecake with and drip onto your cheesecake if you cover it when it’s warm. A long chilling period is crucial. At least 12 hours in the fridge is needed in order for the cheesecake to set up properly and to allow the flavors to meld. Heat helps with a clean release from the pan. 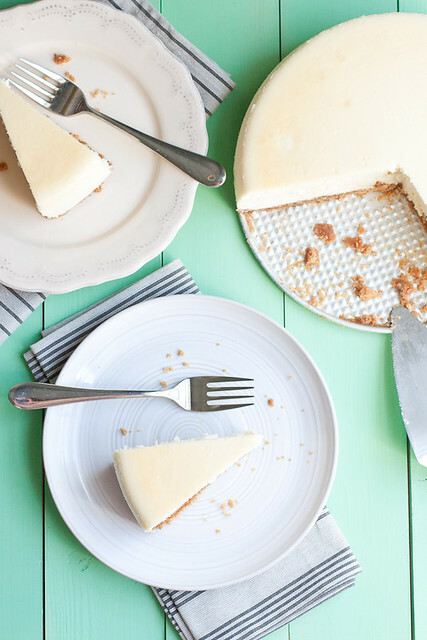 After all this work, you want your cheesecake looking its best for the dessert table, right? You can either run a long, sharp and hot knife between the cheesecake and the side of the springform pan to help it release or warm the outside of the springform pan with a hair dryer (set on low heat). Do one of these before you release the clasp on the pan. After you’ve opened the pan, run a knife around the side of the pan to ease the cheesecake away completely and then slowly lift the springform ring straight up over the cheesecake. Using a hot knife or dental floss to cut the cheesecake. Yes! Unflavored dental floss actually works! You’ll need to muscle it through the crust but this technique works really well to make clean cuts in the cheesecake. Making a cheesecake is always a labor of love, isn’t it? I’ve made this one so many times in the past 6+ years that I’ve got the timing to a science. 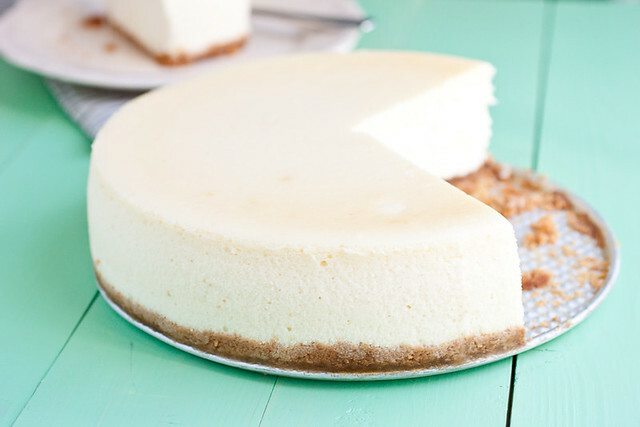 Without a doubt, this cheesecake is best when it’s refrigerated overnight and served the following afternoon or night. So you’ll need to account for this in your plans. Leave the cream cheese and eggs at room temperature for at least 4 hours to soften and warm up before making the batter. Cold cream cheese will lead to lumpy batter and lumpy cheesecake. If you plan to make this at night, be sure to get the cheesecake in the oven by 4:30 or 5pm. It needs nearly 1 ½ hours to bake, 1 hour to sit in the turned off oven (don’t skip this step), and at least 2-3 hours to cool at room temperature before moving to the fridge overnight. The Cook Time above reflects the active baking time for the crust and cheesecake and the inactive time it will sit in the turned off oven post-baking. Prepare the crust: Preheat oven to 350° F. Butter the sides and bottom of a 9-inch springform pan. You can slip a 9-inch round of parchment paper on the bottom and butter that too if you have one handy – it will help to keep the crust from sticking when serving. Wrap the bottom of the pan with 2 layers of aluminum foil or 1 layer of wide heavy-duty aluminum foil. The foil should reach ¾ up the height of the pan. Place the pan on a baking sheet. Bake for 10 minutes. Allow the crust to cool completely on a wire rack while you make the cheesecake. Reduce the oven temperature to 325° F.
Put a full kettle of water on to boil. Prepare the cheesecake batter: Add the cream cheese to a stand mixer fitted with a paddle attachment (or with a hand mixer in a large bowl) and beat at medium speed for 4 minutes, until soft and creamy. With the mixer running on low, pour in the sugar and salt and continue to beat at medium speed for another 4 minutes, until the cream cheese is light. Beat in the vanilla. Add the eggs one by one, beating for a full minute after each addition – you want a well-aerated batter. Scrape down the sides and bottom of the bowl after you add the first two eggs, then again after beating in the last. Reduce the mixer speed to medium-low and mix in the sour cream and/or heavy cream. Scrape down the sides and bottom of the bowl again and give the batter one or two big stirs to ensure the batter is silky smooth. To assemble and bake: Place the springform pan in the bottom of a large roasting pan and pour the batter into the springform pan. The batter will nearly reach the top of the pan. Place the roasting pan on the center rack of the preheated oven and slowly pour the boiling water from the kettle into the bottom of the pan, taking care not to splash the water up on the springform pan. The water should reach about halfway up the sides of the springform pan. Bake for 1 hour and 25 minutes – do not open the oven door during this time. The cheesecake should be very lightly browned. Turn off the oven and prop the oven door open with the handle of a long wooden spoon – don’t open the door more than a couple inches to slip the handle in. Leave the cheesecake in the oven like this for 1 hour, during which time it will continue to cook through from the residual heat of the oven and water bath. After 1 hour, remove the roasting pan from the oven, gently lift the springform pan out of the water and set it on a kitchen towel. Remove the foil – there may be a little condensation water in there so be careful – and dry the bottom and sides. Set the pan on a wire rack to cool completely then cover with a piece of lightly greased aluminum foil and chill for at least 6 hours – overnight is best. To slice and serve: Open the springform pan and gently release the sides of the pan from the cheesecake – you may need a sharp knife to run around any sticky spots. Carefully pull the released pan up over the cheesecake and set aside. With a very hot long, sharp knife, cut the cheesecake. I usually use a very long piece of dental floss to slice the cake into wedges instead of a knife – it makes for a clean cut every single time and allows for you to easily cut evenly-sized slices, but you’ll need to sort of saw it through the crust to cut that too. Serve cold or at room temperature. If you plan to refrigerate the leftovers, slip the springform side back over the cheesecake and recover. Nothing for me compares to cheesecake. It is sublime. What a way to just savory the pure cheesecake flavor. You’re so welcome! It’s my very favorite cheesecake and I love that it’s making other people happy too. Thank you for coming back to leave a comment! the ingredients list both cream and sour cream but in the instructions it says and/or. are you supposed to use both or one or the other? Sara, I use equal parts of each but you can also use just one or the other.